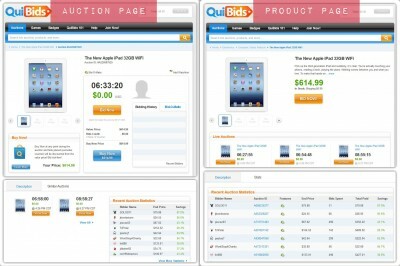 One of the bigger components of the recent QuiBids redesign was the introduction of product pages. It’s a change we’re really excited about for a lot of reasons, the foremost being that it makes casual browsing and full-fledged shopping much faster, easier experiences for our customers. Yay for improved user experience! 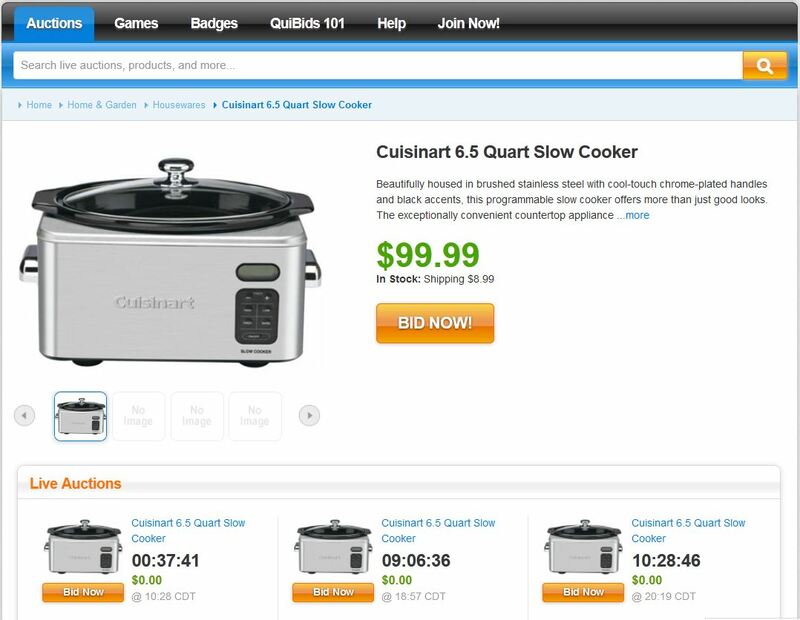 Being an online auction site, we obviously had all of our products listed on their individual auction pages, but that sometimes complicated users’ searches for specific items. Think of all the auctions for a particular item — say a Canon camera — like a bunch of red marbles scattered across the floor. Not so hard to just pick one out, right? Well, when you scatter a bunch of blue marbles (auctions for a Samsung Galaxy Tab) and a bunch of yellow marbles (Monster Cable Beats Pro Headphones) and a bunch of green marbles (HP laptops) out there with them, you’ve suddenly got a gigantic, colorful mess on your hands. Product pages are our way of gathering up all these marbles and keeping them together, so you don’t have to go hunting for loose ones that roll under the sofa. Aside from listing the given product’s description and specs, you can also use product pages to view all scheduled auctions for that particular product and even vital statistics on the last nine auctions for it. All the information you need is centralized on the product page! The one thing you can’t do on a product page is actually bid in an auction for the product, but luckily that’s just a single click away. Does that all make sense? Just to make sure we’re on the same page (sorry, couldn’t resist that lame pun), let’s break down the different functionalities offered by product pages and auction pages. -You can view all scheduled auctions for the given product here. -You can view statistics for the nine previous auctions for the product, including the end price, number of bids spent, total paid, and percent savings. -You can view the auction description here. -This is where you actually bid on the auction. -You can Buy Now here, so long as you’ve cast at least one bid in the auction. -You can view auctions for similar products. -You can view the auction description here also. 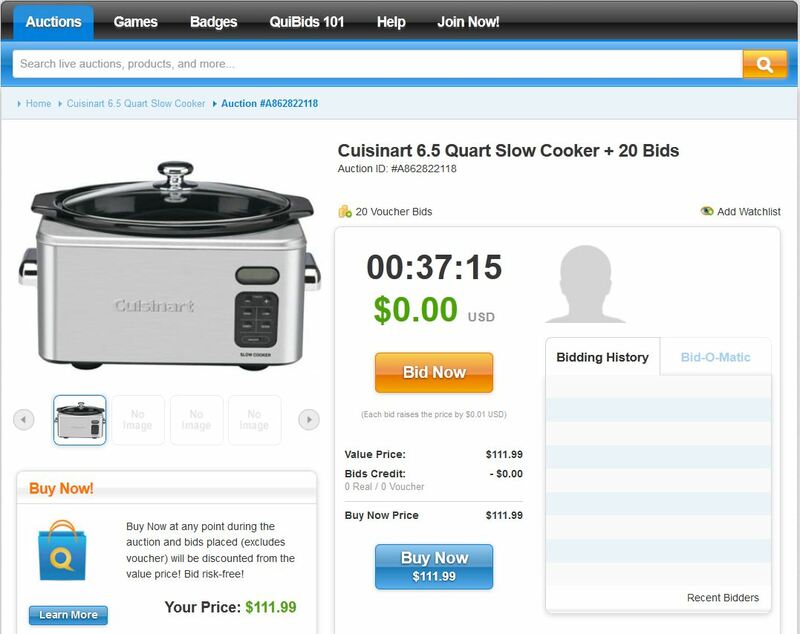 -You can view the immediate Bidding History, including the Bid-O-Matic use and information about each bidding customer. What do you think of the new QuiBids 2.0 redesign so far?